The Department of Motor Vehicles is expected to process 1.4 million immigrants seeking licenses in the next three years as a result of AB 60, a new California law requiring the DMV to issue a driver’s license to applicants regardless of their immigration status. Israel Ortiz, 52, has lived undocumented in the United States for about 40 years. He wants to apply for a driver’s license. But he is unable to because of a minor incident in his past. Ortiz was caught using a fake social security number to get a license a decade ago. Immigration attorney Ana Avila-Cote has heard mixed reports about the DMV’s response to those who have used false identities. A client of hers is being investigated by the DMV for using a false identity, which came up after she went to take her driving test recently. Such applicants may get involved with the DMV’s secondary review process, which typically involves an interview with DMV investigators to verify identity and further review identity documents. “Wait until we get a clear statement from the DMV regarding what they’re going to do with people in that situation,” Avila-Cote said. She also suggested speaking with an attorney if there are outstanding warrants, which some undocumented immigrants may have from avoiding court appearances out of fear of deportation. Many in the undocumented community deplore the fact that the licenses are made distinct with a mark reading “Federal Limits Apply” on the front. Some are worried the mark could lead to discrimination. Avila-Cote said that people for the most part will be safe driving in California. But she said to be careful of going to states like Arizona that are known as being less friendly to immigrants. The mark “signals automatically that someone is here undocumented and they can be potentially put in removal proceedings… If they are trying to use licenses to travel further out, than I think that would be an issue,” Avila-Cote said. The marked driver’s license cannot be used to board a plane and will not be recognized out of state, according to Avila-Cote. She also does not suggest driving to San Diego, where there is a checkpoint. “They can be put in removal proceedings,” Avila-Cote warned. The AB60 licenses differ from those issued to Deferred Action for Childhood Arrival (DACA) beneficiaries. The DMV said in an email that DACA beneficiaries who apply can receive a regular California license, and are not considered AB60 applicants. Meanwhile, some applicants are having a hard time passing the DMV’s written tests, according to local immigrant advocates. A challenge has been that although the DMV handbook is available in Spanish, it is written in a technical manner which immigrants do not commonly speak, Alicia Morales, organizer with the Long Beach Immigrant Rights Coalition (LBIRC), said. “It uses another kind of vocabulary. Some words have vocabulary we don’t use,” said Olivia Solorio, an AB60 applicant currently studying for the DMV exams. To address the problem, LBIRC is partnering with Semillas de Esperanza (Seeds of Hope) to provide driving exam classes to local undocumented immigrants. California is now the tenth state, along with Washington, D.C., to allow its undocumented residents to apply for driver’s licenses. Applicants have had trouble passing exams in those states, as well. After passing a law similar to AB60, about 90 percent of Nevada’s immigrant applicants failed the written exams, the AP reported. The California DMV said it hopes to release pass and fail figures early February. 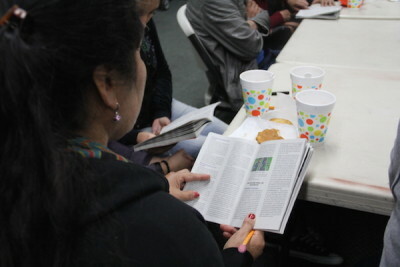 An immigrant studies for her exam at LBIRC’s driver’s class. Solorio is one of about 30 people taking LBIRC’s and Seed of Hope’s driving class in a West Long Beach church. She has taken practice exams from the DMV, but has not done well. “I only read the book a little and I didn’t understand the questions well. They were confusing,” Solorio said. She had many errors on practice exams before, but the classes are teaching her to hone in on key words in test questions. Now that she’s practicing and studying, she’s been getting all the questions right on the practice exams. The class is good timing; her test is coming up on March 24. Despite the challenges, many are on track to get their license. 14,200 AB60 applicants received their license last week. Local Humberto Ursulo was one of them. Being undocumented, he had driven to work for years without a license. He had no choice. He works the graveyard shift and the buses don’t run at that time. He has lost his car to the impound lot and paid thousands of dollars in court fees after being pulled over multiple times. But as of today, Ursulo has a license thanks to AB60. He is one of many drivers who won’t have to worry anymore about having their cars impounded for driving without a license. “Things are calm now. I don’t have that fear anymore. So much has changed,” Ursulo said.